October 14 is Friedrich Kohlrausch’s birthday. 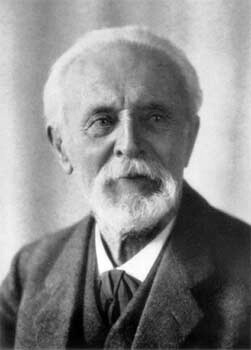 Kohlrausch was a German physicist who investigated the physical properties of electrolytes. Electrolytes are solutes that break down into ions when dissolved in a solvent like water. One example of an electrolyte is common table salt, NaCl. Salt dissociates into two ions Na+ and Cl– in water. The charge on these ions introduces interesting electrochemical properties. Kohlrausch was interested in these electrochemical properties. At infinite dilution, the dissociation of an electrolyte is complete and hence each ion makes a definite contribution to the equivalent conductivity of the electrolyte irrespective of the nature of other ions associated with it. The limiting equivalent conductivity of an electrolyte is the sum of the limiting equivalent conductivities of the constituent ions. In other words, the total conductivity of a solution is equal to the sum of all the conductivities of the positive ions (cations) plus the sum of all the conductivities of the negative ions (anions). This work was of great interest to the new breed of Ionist chemists in the 1880s. Chemists like Svante Arrhenius, Wilhelm Ostwald, and Jacobus van ‘t Hoff made extensive use of Kohlrausch’s measurements and theories of the behavior of ions in solution. Some would argue he was one of the earliest physical chemists. He would spend much of his career designing new instruments to make precision instruments and experimental techniques to measure electrical and magnetic properties of solutions. 1991 – Walter Maurice Elsasser died. Elsasser was a German physicist who proposed the geodynamo theory to explain the way the Earth generates a magnetic field. The theory describes how convection within the core of the planet driven by radioactive decay would generate an electric current. This current would induce currents in different layers of the mantle which are traveling at different speeds. The different speeds would produce eddy currents that would create the magnetic field. 1984 – Martin Ryle died. 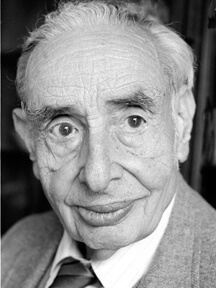 Ryle was a British radio astronomer that shares the 1974 Nobel Prize in Physics with Antony Hewish for his invention of the aperture synthesis technique. He developed this interferometer technique to resolve weak radio signals from stellar sources. This allowed astronomers to discover galaxies further away than was ever seen before. 1947 – First manned flight to break the sound barrier. Chuck Yeager standing beside the X-1. The United States Air Force’s Bell X-1 aircraft was the first manned aircraft to go faster than the speed of sound. 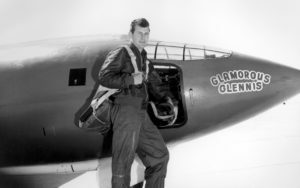 Pilot Charles “Chuck” Yeager was dropped from a B-29 bomber and ignited the aircraft’s rocket engines to clock in at 1.06 times the speed of sound. 1940 – Heinrich Kayser died. Kayser was a German physicist that worked with Carl Runge to determine the spectra of many chemical elements. During these investigations, he discovered the presence of the element helium in the Earth’s atmosphere. This was the first instance where helium was discovered outside the Sun’s spectra. 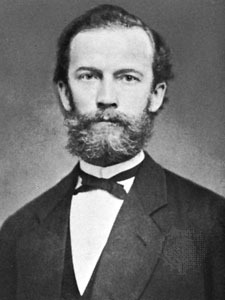 He and Runge developed an empirical mathematical formula to explain the grouping of spectral lines independently of Johannes Rydberg. 1914 – Raymond Davis, Jr. was born. Davis was an American physicist who shared half the 2002 Nobel Prize in Physics with Masatoshi Koshiba for the detection of cosmic neutrinos. Davis attempted to detect neutrinos by investigating the process of reverse beta decay. Reverse beta decay occurs when a neutrino interacts with just enough energy with a nucleus of a stable isotope and creates a radioactive isotope. Davis also headed the Homestake experiment to detect solar neutrinos. This detector was built at the bottom of the Homestake Gold Mine in South Dakota. It was the first time solar neutrinos were successfully detected. The detector only detected a third of the expected neutrinos. The subsequent search for the reason lead to the discovery of neutrino lepton flavors in Koshiba’s Super-Kamiokande Observatory. 1840 – Friedrich Wilhelm Georg Kohlrausch was born.